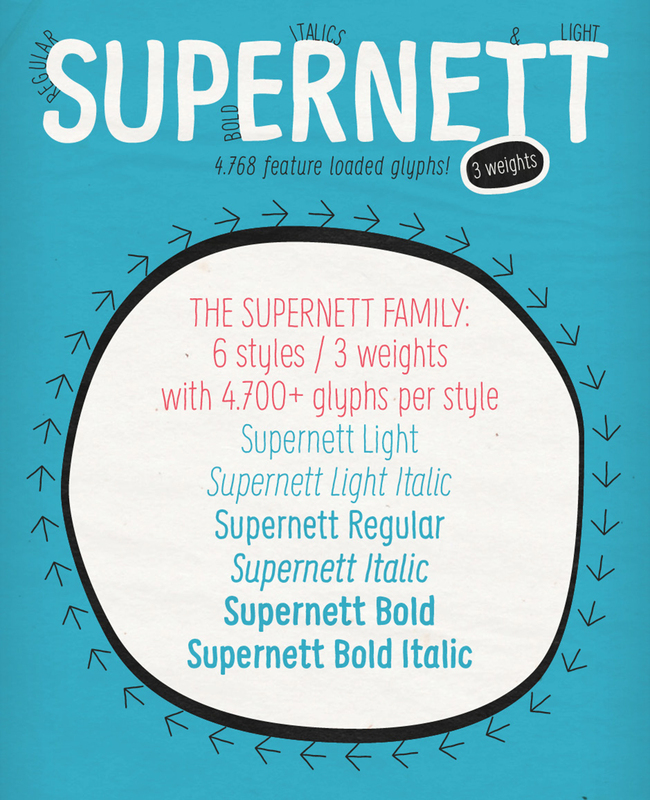 Supernett is a hand drawn Sans-Serif with 4,700 glyphs per Style and True Italics. This hand drawn Sans offers alternating and rotating letters as well as a varying baseline shift. It has 6 hand drawn Sans making it perfect for food, packaging and so much more! Have you ever tried drawing a Sans-Serif by hand? Georg Herold-Wildfellner did and out popped Supernett, a 6 weight hand-drawn font family with more than 4,700 glyphs per style. Supernett – a fairly condensed display Sans – is tailored for large font sizes but also impresses with an astounding legibility in small typesettings. Supernett – a fairly condensed display Sans – is tailored for large font sizes but also impresses with an astounding legibility in small typesettings. There’s a slew of OpenType options to intensify the handmade touch: Need some rotation in your work? With OpenType Swashes you can randomly rotate all glyphs around their own axis. OT Tilting Alternates offers a varying baseline shift for each single glyph. Finally activate OT Contextual Alternates and all letters and numerics alternate randomly between three different variants. Activate Contextual Alternates and all your letters and numbers alternate randomly between three different variants. With the OpenType “Swashes”, you can randomly rotate all glyphs around their own axis. OpenType “Tilting Alternates” moves every single glyph up or down on an individual basis. The Supernett family in total includes 6 hand-drawn styles and is tailored for food-, magazine-, book- and packaging-design. The extensive character set supports Central and Eastern European as well as Western European languages. File size is approx 5.5MB (9.4MB unzipped), offered as a single download.